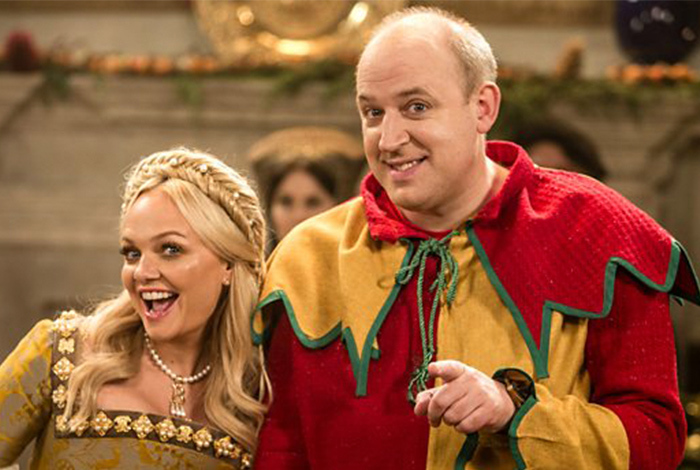 Master of the pun Tim Vine journeys back in time to Tudor England in a quest to find a silver lion and bring Christmas to Henry VIII’s court. It is Christmas time at Tim’s antiques shop, and special celebrity guest Emma Bunton needs Tim’s help. Can he make this antique silver lion as good as new? Thanks to his time-travelling grandfather clock, the answer is always yes! Tim travels back to Tudor England, arriving in the court of Henry VIII just as the Christmas celebrations are getting under way. But finding a silver lion isn’t going to be as easy as it seems. Catherine of Aragon has a new lady-in-waiting, Anne Boleyn, who is desperate to impress – and save her head – by arranging a fantastic Christmas party for the king. There is just one problem – no one has responded to the invitation. And when Tim meets the king, he is mistaken for the new court jester and immediately put in charge of the entertainment. Looks like the search for a new silver lion will have to wait. Can Tim step up to the plate as the new court jester and pull off a party fit for a king? Can he find the silver lion and get back to his shop before Christmas? Can he fit any more puns into half an hour?! Only time travel will tell.